QuickTime came along in 1991, but it's just now turning three. In early December Apple released a public "Developer Preview" version of its flagship multimedia tool, and early indications show this new QuickTime 3.0 offers many improvements in features and cross-platform compatibility. Expect to see a final release of QuickTime 3.0 in January, perhaps around the time of MacWorld Expo in San Francisco. 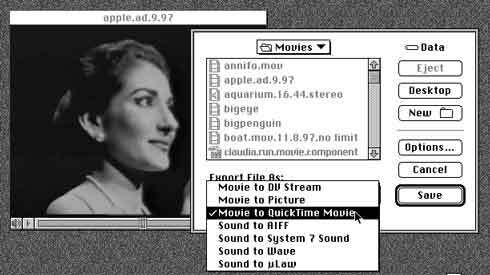 QuickTime has always been among Apple's premier technologies. As other "cool" Apple tools like OpenDoc and QuickDraw GX came and went, QuickTime has only gotten better. Now an industry standard for creating full-screen broadcast-quality video productions via desktop computer, QuickTime also has become a central player for creation and delivery of video and audio on the World Wide Web. Since its inception, QuickTime has been an important standard for CD-ROMs. Among many enhancements, what QuickTime 3.0 offers is a variety of improved toolsets like built-in video transitions and filters, and support for a vast array of new graphics formats. Movie Player, Apple's free QuickTime editing program, also comes with new capabilities. Windows computer users have been able to play QuickTime movies authored on Macs for a few years now. But now, they will have the same ability "under the hood" to create movies that Mac users have for years. On first glance this may sound bad for the Mac, but not necessarily. What this new-cross platform QuickTime ability means is that Microsoft's lame movie making tool "Video for Windows" (or AVI) could disappear as developers for both platforms standardize on Apple's superior QuickTime. Because the file types and feature sets in QuickTime on Windows and the Mac are now the same, this will make it easier for developers to create new QuickTime editing programs that work for everyone regardless of platform. The mainstream computer press endlessly compares QuickTime to Microsoft and Intel alternatives, and whether Apple's offering stands a prayer of a chance in a Wintel-dominated future. For my money I don't care. If people want to drive a Chevrolet, they use Intel's Indeo or Microsoft's Video for Windows. If they want to drive a Porsche, they use Apple's QuickTime. QuickTime is a superior, stable, mature, feature-laden technology that offers great value in creating synchronized digital motion media. Microsoft has nothing to compare in performance and adaptability. Intel's Indeo Video may offer some value but QuickTime is an open, diverse system that's widely used by people seeking multiple capabilities and wide compatibility. QuickTime 3.0 offers enhanced 3D tools, VR tools, Web abilities, and support for more than two dozen file formats such as MPEG, vector graphics, alpha channels, MIDI, sprites, text tracks, multiple languages, CD-quality audio, IMA compression, uLaw, and more. That said, I'll look at a few useful and interesting features available right now in QuickTime 3.0 and Movie Player. To take advantage of these new options, point your Web browser to www.quicktime.apple.com, download and install the QuickTime 3.0/Movie Player package. This stuff is free. This current "beta version" expires January 6, but Apple promises a newer beta or release version by that date. 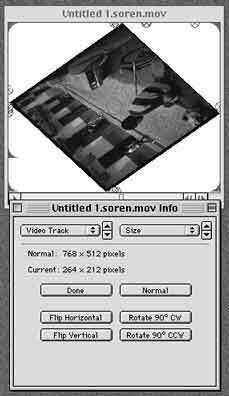 In the past if you wanted to create a movie from a selection of still photos such as Mac desktop screen shots, either you had to use an arcane tool called "Convert to Movie" from Apple, or you had to use a full-fledged editing program. No more. Movie Player 3.0 allows you to import an "Image Sequence," and you can choose how long each picture appears on screen: from 12 a second to one every 10 seconds. You create a folder of images (with same size dimensions) in graphics formats such as PICT, TIFF, or JPEG, and give them filenames including sequential numbers. Once the sequence has been imported, save this as a "self-contained" movie. Make a Slide Show: Movie Player now allows you to import a sequence of still images to create a slide show. This box shows the frame rate choices available when you are creating your movie. Once you've saved your movie, you can use Movie Player 3.0 to recompress the slide-show movie into a different format or frame rate better suited for playback from a CD-ROM, or for posting to a web site. For that matter you can now use Movie Player to recompress any existing movie to a new format, frame rate, or audio quality. Previously you needed a (sometimes costly) editing program like Premiere to achieve this. What's New is Old: Though this compression dialog box looks like any other, what's new is that you can now select compression parameters like these from within Apple's Movie Player 3.0. This allows you to use this free program to make and compress movies without buying an editing program. Say you've got a movie you want to make look like "old film" by adding dirt and hair, or you want to make it look like color film from the 1930s, or even black and white film. Perhaps you'd like to create an embossed look, sharpen the images, or change the color balance. Now you can use QuickTime 3.0 and Movie Player to achieve these effects. Open an existing movie, select the menu command "Export," and select format "QuickTime to QuickTime Movie." Once you've got that, select the "Options" button in the dialog box, and up comes another window that allows you to select filters, video compression options, frame rate, and audio format and quality. Select the filters, and save the movie. QuickTime to QuickTime: Under QuickTime 3.0 Movie Player also now allows you to export an existing QuickTime movie as a QuickTime movie. This new feature allows you to alter movie parameters such as frame rate, size, quality, or even add several video filters using a selection built-in to QuickTime. Apple redesigned QuickTime so it directly supports scene transitions like dissolves and wipes, this to establish tools inside QuickTime itself that mesh with SMPTE (Society of Motion Picture and Television Engineers) broadcast standards. Apple looks to make QuickTime appealing as an industry standard for both desktop computers and broadcasting where digital editing tools are used. Right now the transitions feature set is still being completed. For end users to benefit from this change, existing and new QuickTime movie editing programs will have to be rewritten to take advantage of transitions. 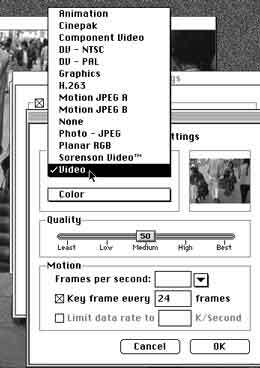 This means QuickTime itself will offer transitions on a system level, they will be standard across all computer platforms supporting QuickTime, and transitions will no longer depend on specific features built into individual QuickTime editing applications like Adobe Premiere, Paceworks' Object Dancer, or Avid Cinema. 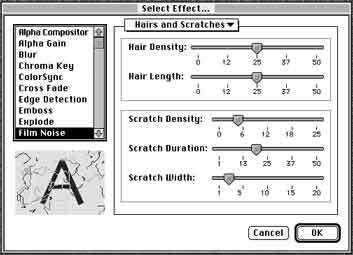 A movie created using these transitions will work seamlessly on a Mac, Windows or Silicon Graphics computer, for example, regardless of effects used. That Old Time Look: Movie Player allows you to add video effects to movies under QuickTime 3.0 Here is a video effects selection box that will add hair and dirt to video, and you can choose parameters like hair size and length. Movie Player now allows you to flip a movie 90 degrees, rotate the images, or skew them within the frame. You take advantage of this by using the "Get Info" menu item in Movie Player. Then select the video track and select the "Size" option. You can click the adjust button and then use the red handles that appear in the movie window to rotate, skew, and otherwise distort the video images. Why someone might want to do all this is beyond me, but at least you can now you can perform these manipulations where before you could not. Backwards and Upside Down: Are you interested in making your movies play backwards? How about rotated onto the diagonal? You can now skew and flip movies using the size alteration features found in the "Get Info" menu of Movie Player. Once QuickTime 3.0 releases, look for many of the existing editing programs to release new versions to take advantage of QuickTime's added abilities. For the moment though, Apple's free Movie Player offers a significant glimpse at what the near future holds.